As you can see from the screenshot above, I get a list of the output fields, which are the input fields plus the fields I specified in the table at the bottom of the dialog. Also notice that I did not define the variable/field "c" in the script, but I set "Script result?" to Y for "c", and thus "c" will contain the result of the script evaluation (in this case, b * rowNumber). 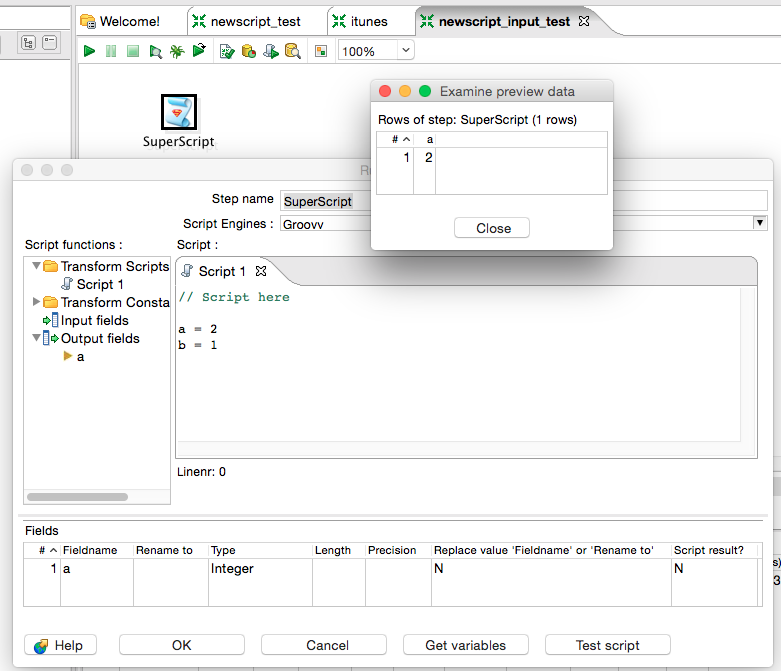 Perhaps the most fun and powerful addition is the ability of SuperScript to execute any JSR-223 Script Engine. The existing Script step requires that the Script Engine produce CompiledScript(s), which of course is the fastest but not always available. To that end, SuperScript will attempt to compile the script first, and if it cannot, it will fall back to evaluating (i.e. interpreting) the script(s). 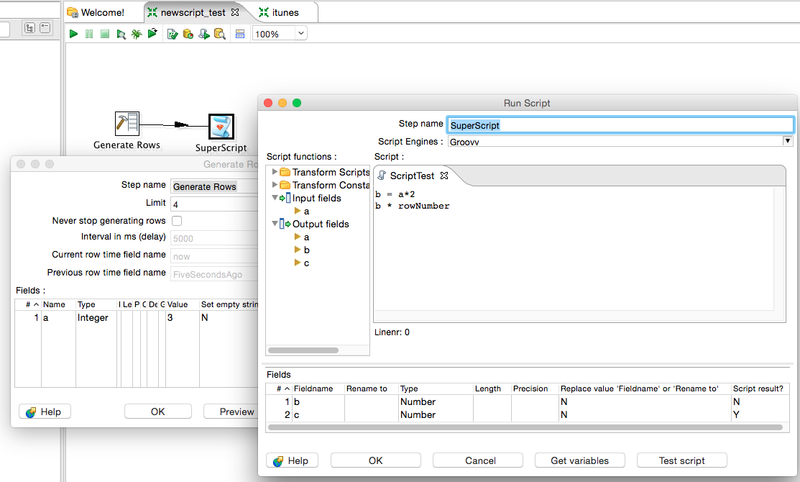 This opens the door for a lot of new scripting languages, such as Jython, AppleScript, and Renjin (an R ScriptEngine for the JVM). 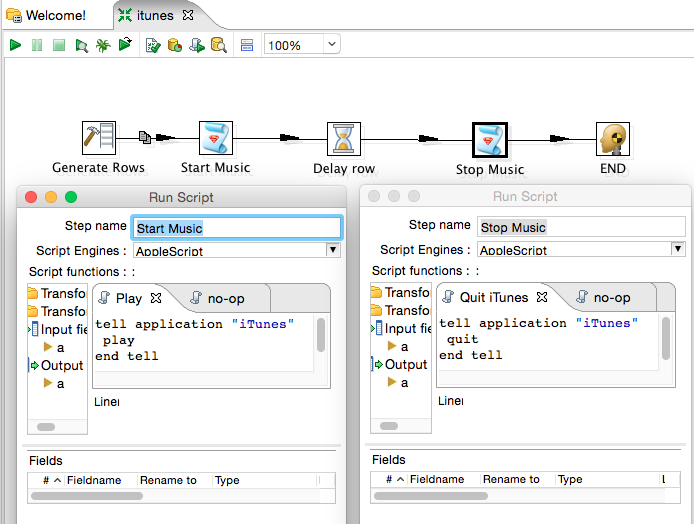 NOTE: The AppleScript script engine is afaik only available on the Mac and comes with its JDK. I hope you find this plugin helpful, and I'd love to know how/if you are using it, and also how to improve it. One improvement I hope to add is the ability to choose different plugin(s) to link to, in order to use their capabilities. This would likely be done by creating a chained self-first classloader, and could be useful for things like Big Data capabilities from inside the SuperScript step. How sorted (or sordid) is your data? 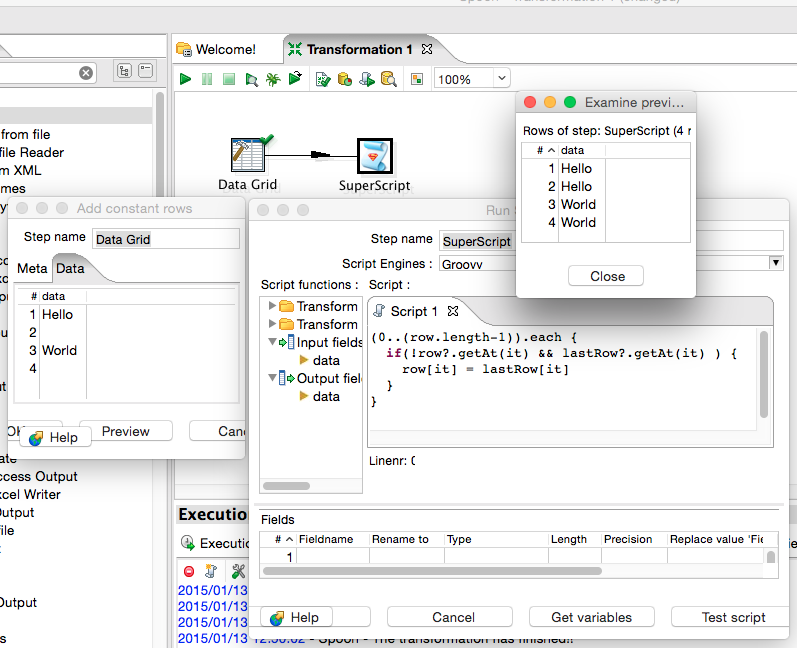 I've spent quite a bit of time looking at Pentaho Data Integration (aka Kettle) and trying to make it do things with external technologies and idioms, anywhere from Groovy, Drill, memcached, Redis, Hazelcast, and even Markov Chains. Recently though, I've been started to focus on the data coming in and out of PDI, and what I could learn from it (#datadiscovery). 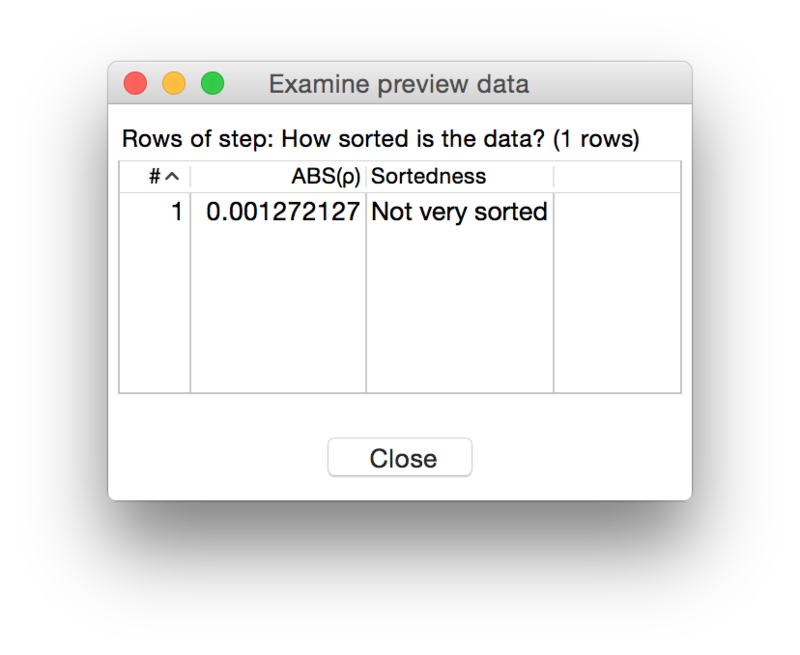 I'll be spending a lot more time with R and Drill soon, but as a small example of data discovery, I thought I'd look at "how sorted" data is. Basically I wanted to know for an input stream (consisting of CSV files or database tables or whatever), is the stream close to being in a sorted state or not? I am currently looking into approximate and probabilistic methods (like Longest Increasing Sequence and an interesting "multiplayer" version here), but this post is about a brute-force method of finding the variance of distance between an element in a stream and where it would be if the stream were sorted. Specifically, I looked at the rank (aka row number) of the incoming data as the row number of the raw input, then in parallel I sorted on the desired columns and ranked the sorted rows. I was looking for the distance between each row's value(s) and how far the rows were from their sorted position(s). My research (read: Google search and Wikipedia) brought me to the Spearman rank correlation coefficient. 1) No scripting steps: Of course you can do whatever you like with the Scripting steps, but if you don't know those programming languages, you're left with the rest of what PDI offers. Luckily the choices are plentiful and powerful. 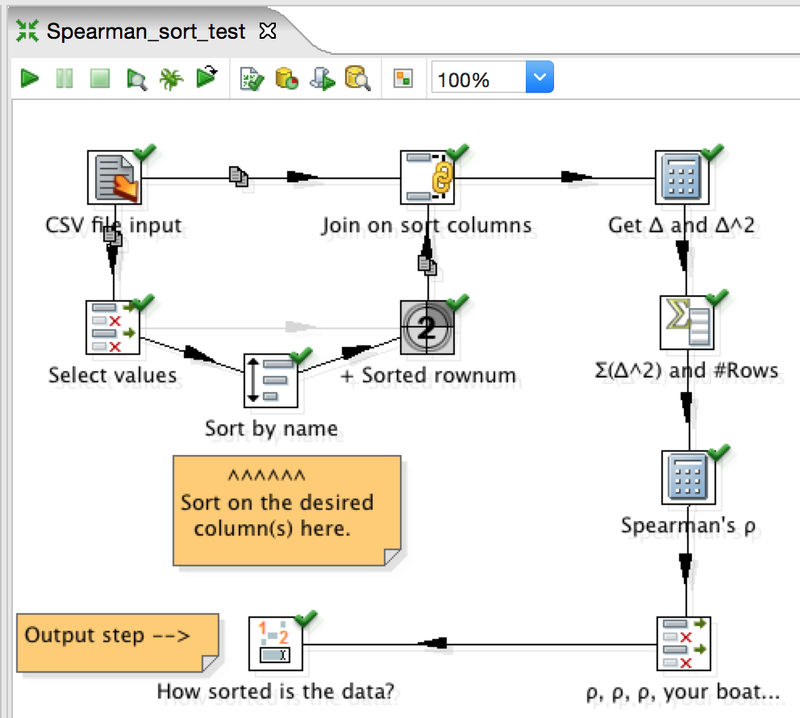 2) No SQL steps: Most databases probably offer the kind of expressive power you'd need to write a "Spearman rho" function inline, and to be honest that's probably the best option performance-wise; but I was looking to create a data-agnostic, language-agnostic way to calculate the "sortedness" of a data set in PDI, as this could be used in a blending or refinery situation. The absolute value of the Spearman rho for customer-100.txt (when sorted on name) is 0.001272127. I used absolute value because I didn't care whether the stream was close to being sorted or reverse-sorted; if you care about that in your usage, then leave out the ABS(rho) calculation in the "Spearman's rho" step above. Being so close to zero, we can determine that the data is not very well sorted, as a result of the Spearman rho telling us that there is no tendency for the raw data and the sorted data to follow any sort of trend of monotonicity (ascending or descending). If the values were to get closer to 1 (or to -1 if not using absolute value), then the stream would be closer to its sorted state and thus "more sorted". I set up a rudimentary Value Mapper step ("How sorted is the data?" above) to indicate whether the data was well-sorted or not. If you disable the sort path and enable the direct path around it, then the two rowsets will match and you will get 1.0 as the Spearman rho.